This May 1st, GCN and Extinction Rebellion will come together for a night of information, conversation and action on climate change. Entertainment 12 April, 2019 . Written by Cassia Gaden Gilmartin. The world is in ecological crisis: we are in the midst of the sixth mass extinction event this planet has experienced, and scientists believe we may have entered a period of abrupt climate breakdown. This is an emergency. So join GCN and Extinction Rebellion Ireland this May Day to talk about what each of us can do to effect meaningful change. 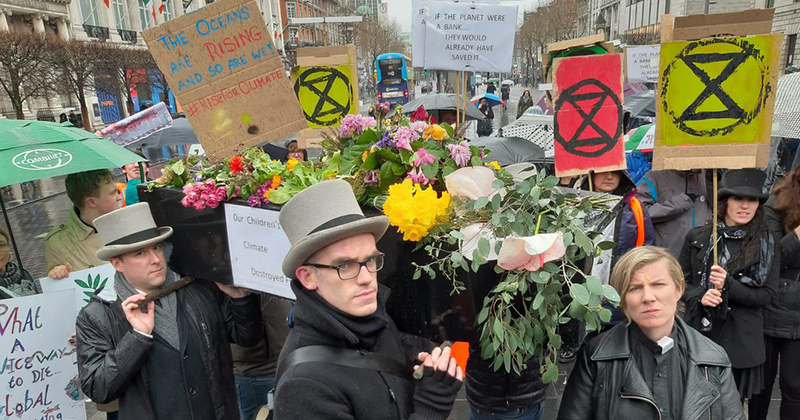 Extinction Rebellion Ireland is the Irish branch of an international movement that uses nonviolent civil disobedience to achieve radical change in order to minimise the risk of human extinction and ecological collapse. GCN will be teaming up with them this May 1st for an evening of information, conversation and action in the Project Arts Centre, from 7.30-9.30pm. The night will begin with a presentation by Dr Ciarán O’Carroll of Extinction Rebellion Ireland, who will share the latest climate science on where our planet is heading, discuss some of the current psychology around climate change, and offer solutions through the study of social movements. We will then host a panel discussion with invited guests – including John Gibbons, Oana Marian and Carol-Anne O’Brien, with more to be confirmed – to discuss the climate emergency we all face and talk about ways to remain hopeful while creating positive change. Oana Marian of Extinction Rebellion and Active Hope Network will share reflections on climate justice and climate grief, on how to act in time of crisis without remaining in crisis, and on the need for creative, compassionate, accountable and anti-racist responses within environmental activism. For more information, see the Facebook event. Tickets, at €10 per person or €8 for students and the unwaged, are available now. 12 April, 2019 . Written by Cassia Gaden Gilmartin.